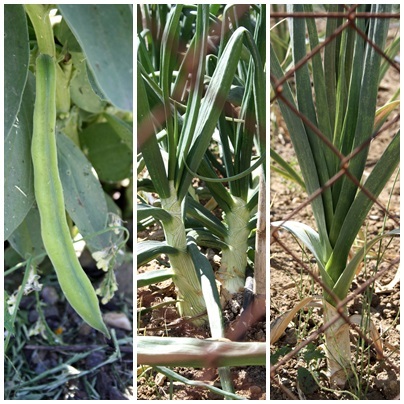 I also photographed some spring onions (Spanish ones are massive in case you were wondering) and some young leeks. These three things are cheap and plentiful at the market right now as well as spring garlic shoots. 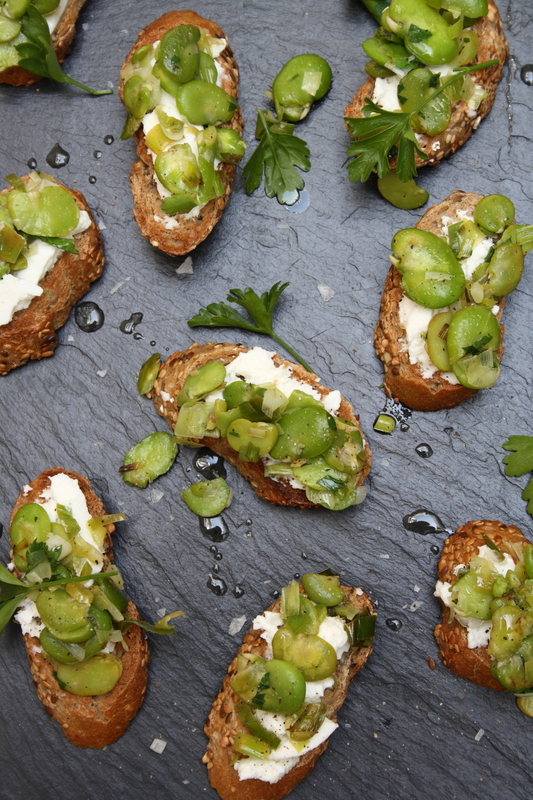 I bought a kilo of broad beans so sharing the job was a good idea. Podding the beans is the first part then you blanche them for a few minutes in boiling water, cool them down under cold running water, then you squeeze the bright green, sweet beans out of their pale jade cases. This may sound like a faff too far but it is hardly taxing (while sipping a cool drink under an umbrella) and it really makes all the difference to the freshness of the dish. Look at the colour of them, aren’t they pretty? Pod the beans then cook in boiling salted water for 2 minutes. Plunge into cold water to stop the cooking or run under the cold tap until cold. Then squeeze the bright green beans out of their pale green cases. Toast the baguette slices on both sides under the grill and set aside. Heat 1 Tbsp olive oil in a frying pan over a medium heat, add the sliced spring onions, leeks and green garlic. Season with salt, pepper and a little thyme. Cook for a minute or so until starting to soften, then add the broad beans, stirring to coat. Cook for a few minutes more, add a squeeze of lemon juice, the chopped parsley and check for seasoning. 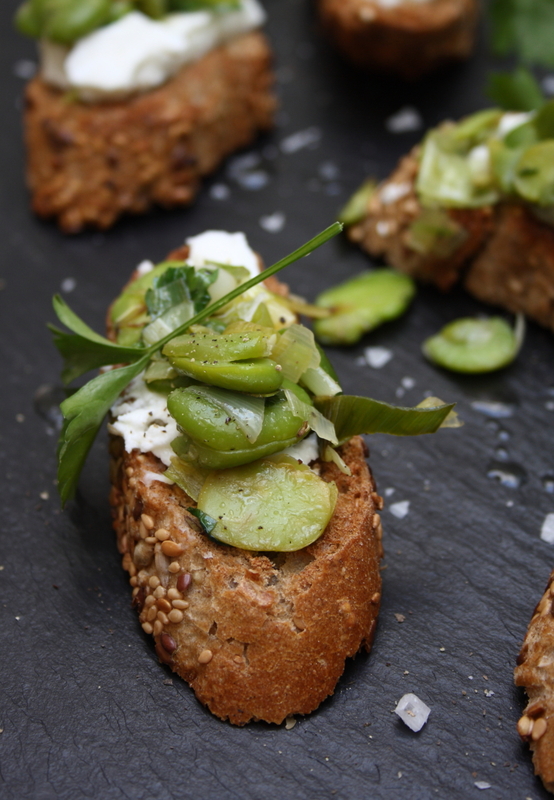 Spread or crumble a layer of goats ricotta/cheese on each baguette slice, top with a spoonful of the broad beans and put on your serving plate. Continue with the rest. To serve, top with some fresh parsley leaves, a sprinkling of sea salt and a few drops of olive oil. I’m thinking a long, cool white wine spritzer to go with this. You may prefer a Mojito though. I know I said I would let you know about our new business venture in this post. Well I lied. You’re gonna have to wait. Spring has definitely sprung. 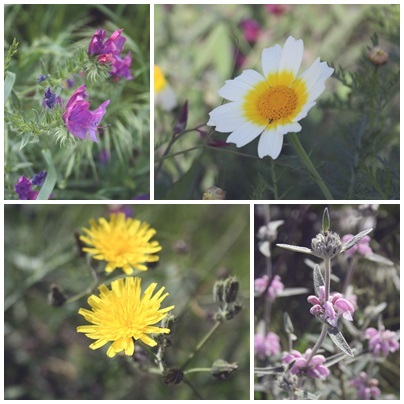 The wild flowers are wafting their sweet fragrance in the mornings where I run with the dog so my thoughts turn away from steaming hot soups and comforting stews towards lighter flavours and all things fresh and green. 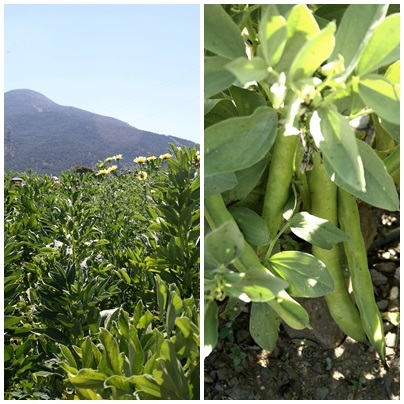 I bought some fresh peas in their pods from the farmers’ market on Sunday. 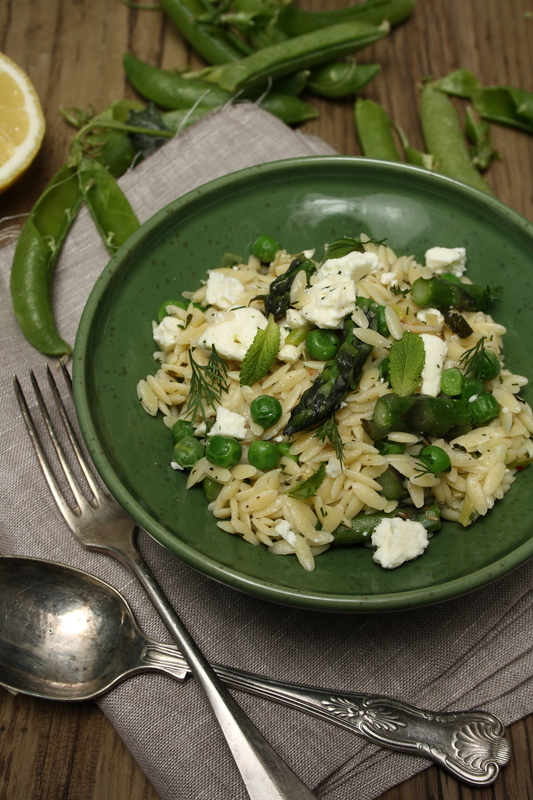 There is nothing more spring-like than peas, except for maybe asparagus. This recipe has both. In fact it has all my favourite spring flavours in one dish. There’s also fresh mint, dill, lemon, spring onions, spring garlic and feta. Is it singing to you yet? Orzo, in case you don’t know, is a rice shaped pasta. If you can’t find it (I got mine in Eroski, believe it or not, in the Moroccan section) you could use any small-ish pasta shapes or even cooked rice. 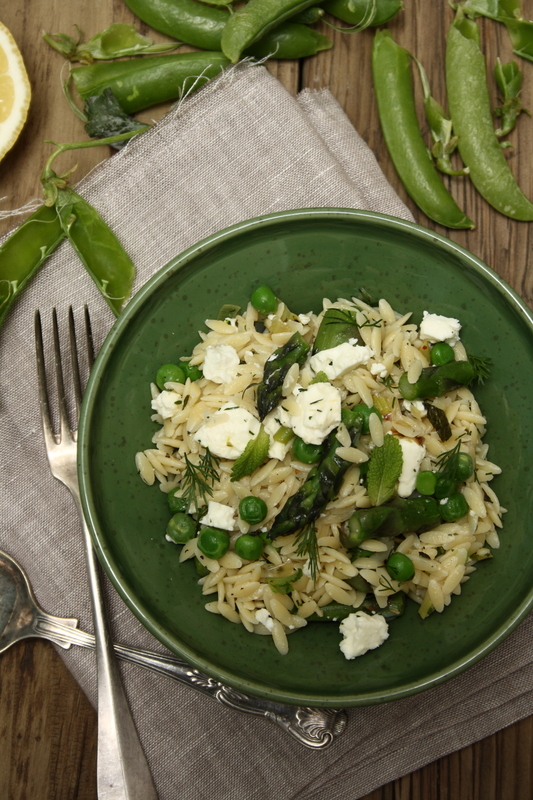 The good thing about orzo is that it doesn’t go all flabby and stick together when it is cooked so it is perfect for salads. 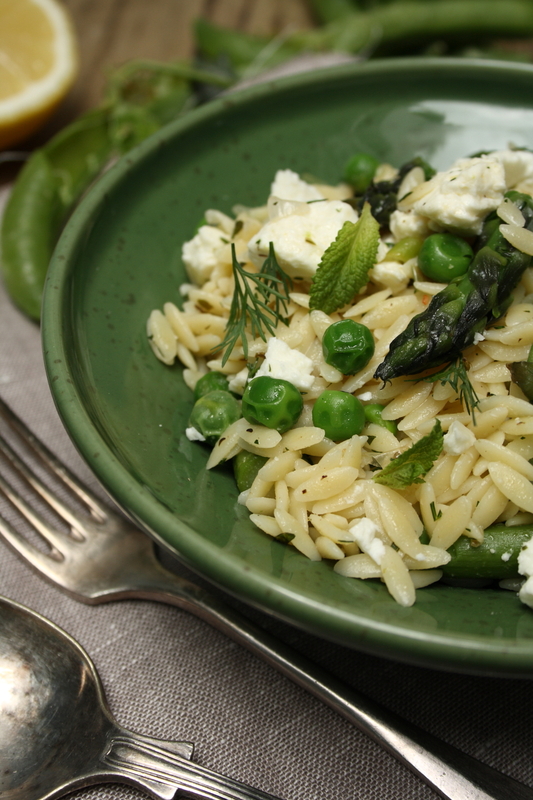 You toss all the ingredients and the dressing over the cooked orzo while it is still hot so all the flavours get absorbed and start to mingle. Leave it to cool to room temperature then you can store it in the fridge. 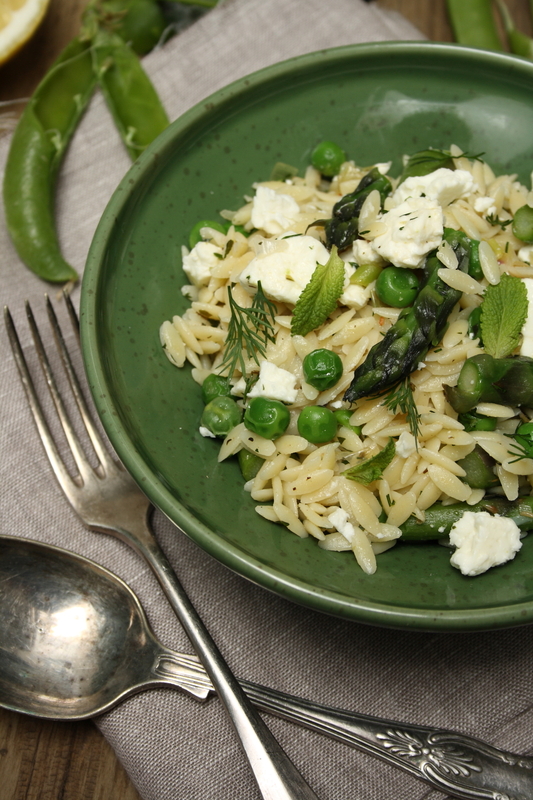 The feta and fresh herbs are best stirred through just before serving. This is an ideal lunch that would be easy to take to work or for a weekend picnic. Cook the orzo in lots of boiling salted water for about 8 minutes until al dente and drain. Meanwhile, cook the spring onions, baby leek and spring garlic in a tablespoon of olive oil over a medium heat with a pinch of salt some black pepper, the thyme, oregano and chilli flakes until softened. Mix this with the drained cooked pasta in large bowl. Add the olive oil, lemon juice and season with salt & black pepper. Leave to cool. Trim or snap the woody ends off the asparagus and cut into 1 inch pieces. Shell the peas. 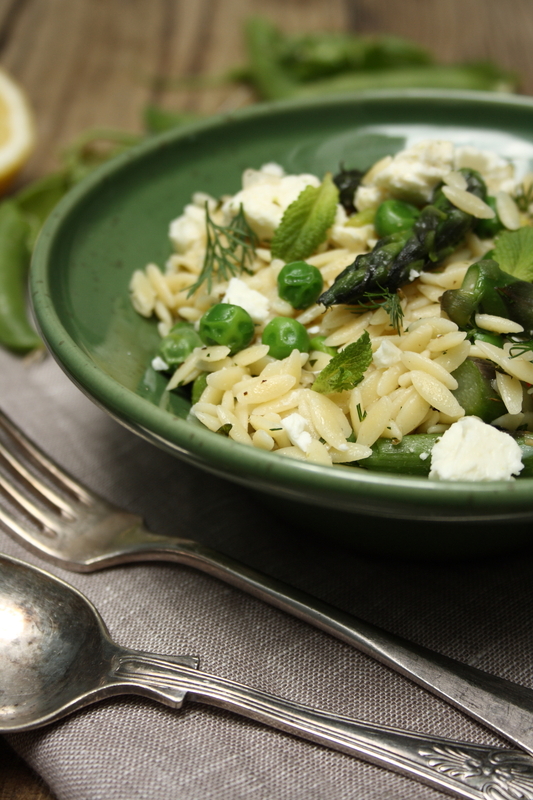 Cook the peas & asparagus in boiling salted water for 3 minutes then drain and add to the orzo, Stir everything together well. Leave to cool to room temperature. It can be stored in an airtight container in the fridge from this point. 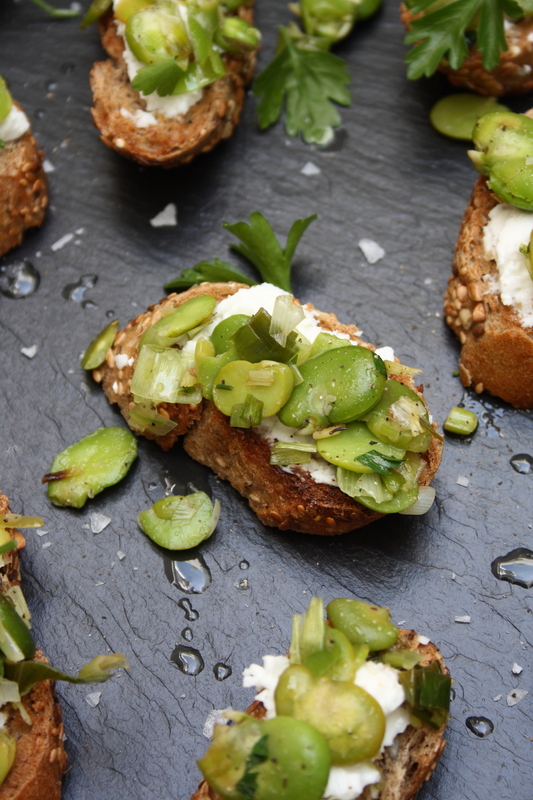 When ready to serve stir through the crumbled or cubed feta and the chopped herbs. Taste for seasoning, add more salt or lemon juice if required. Say hello to spring even if it is raining where you are! Have a lovely week whatever the weather. I have been wanting to make a vegetarian version of the savoury and sweet Persian celebration dish, Fesanjan for a long time. It is normally made with chicken or lamb but I have used aubergine and sweet potato as the meat replacements. Pumpkin or squash would also be lovely in this or maybe even some meaty mushrooms. The reason that I have been desperate to make this is because I love pomegranates. There are hundreds of pomegranate trees were we walk with the dog and The Washer Up is always screaming at me to stop taking photos of them, but I can’t. “Not another bloody picture of a pomegranate” he says “How many do you need?” he asks impatiently “You must have thousands already, along with all the pictures of blooming oranges”. “It’s what I do!” I reply. This is the perfect dish to showcase the beautiful pomegranates that are plentiful and cheap here at the moment. I use their ruby jewels a lot as a final garnish, like on this Lebanese Lentil Salad where their sweet and sourness pops in your mouth, livens up the whole dish and, of course, they look lovely. I have also topped this Savoury Feta Cheesecake with a generous glistening pile of them for an impressively dramatic but surprisingly easy to prepare dinner party dish. In this dish though it’s the juice that gets to take a leading role. Traditionally pomegranate molasses (a reduced thickened pomegranate syrup) would be used but I can’t seem to find any here. I used the juice of four pomegranates and some veg stock as the liquid in which the vegetables are cooked. Along with the ground walnuts that thicken the stew while it cooks, these are the two most important ingredients in the recipe. They give it colour, texture and flavour. You can obviously buy pomegranate juice in a carton if you like, but I wanted to try it with my beloved pomegranates. Juicing a pomegranate is quite a mission but you get used to it. I did most of it on my normal hand orange juicer, bursting any jewels left in the top of the juicer and squishing the juice out with my fingers. I then squeezed what was left in the fruit directly into the pot by hand. I got about 500 ml of juice from four big pomegranates. Heat the oil, in a large pot, over a medium heat and cook the onion with a pinch of salt for about 4 mins until softened, then add the spices, cook for a minute or so (add a splash of stock if it’s dry), then add the ground walnuts, aubergine & sweet potato. Stir to coat in the spices then add the pomegranate juice and stock. Bring to the boil then lower the heat, partially cover and simmer for 15 mins. Remove the lid then simmer again for 25-30 mins until the sauce is thickened, it shouldn’t be liquidy. Taste for seasoning, it should be quite sweet and a little sour. Add more salt, lemon or honey/sugar until you are happy. Serve garnished with pomegranate jewels, chopped walnuts and a few parsley leaves. This isn’t authentic but it isn’t the prettiest of dishes otherwise, it’s very brown so the pomegranate seeds brighten it up a bit. Serve with some plain rice and a herby green salad like the ones we served the lovely Iranian family that we cooked for over the summer. They use herb leaves whole as a salad leaf rather than as a garnish. I topped it with pomegranate seeds obviously, but then I am obsessed. Apparently. I hope they approve of my vegetarian version of Fesenjan! Beetroot is one of those vegetables that I used to hate. It’s because of that nasty pickled stuff in the jars that leaks pink juice over everything else on your plate, contaminating it with cerise vinegaryness. Or is that just me? It turns out that unpickled freshly cooked beetroot is sweet, earthy and delicious when roasted or made into purees or soups. It is also an amazingly deep, dark burgundy colour that turns a fabulous shade of fuchsia when mixed with anything white. Like white cheese, yoghurt or sour cream. Or clean white tablecloths. 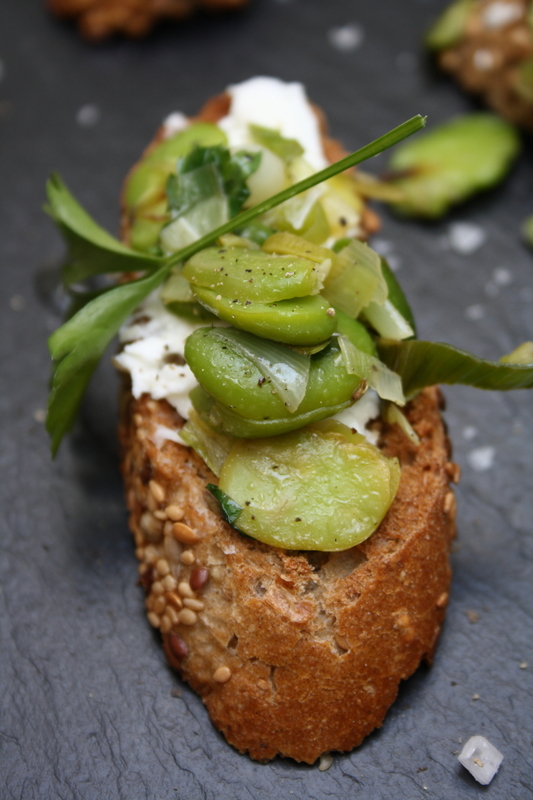 It’s close relationship with white cheese isn’t only about colour mixing, it’s about flavour mixing too. You could just swirl a dollop of sour cream or Greek yoghurt on top of this soup and still be treated to the sweet-sour, spicy-cool, hot-cold taste sensations that you get from every mouthful of this simple soup. But adding the extra crunch that you get from a toasted slice of rye bread topped with creamy feta mixed with fresh herbs, green chilli and spring onions that you then put under a hot grill to melt, bubble and brown slightly, takes this humble soup to a whole new level. You could also use pre-cooked beetroot to save time. It comes shrink wrapped in plastic. Don’t buy the pickled stuff in jars for this. That would be a disaster. Heat the oil in a large pot and cook the onion over a medium heat for about 4 minutes until softened then add the garlic, thyme, cumin & chilli flakes and cook for another minute or two. Add the diced beetroot and the stock and season with salt & black pepper. Bring to the boil then lower the heat, cover and simmer for 10-20 minutes (depending on the size of your dice) until the beetroot is cooked and tender. Add the tomate frito and heat through. Blend carefully with a stick blender (cover the pot with an old tea towel if you don’t want pink soup everywhere) or puree in a blender or processor until very smooth. Add more stock or water if you need to, to get the desired consistency. Taste for seasoning. Preheat the grill to hot and brush both sides of the rye bread with a little olive oil. Mix the feta and a drizzle of olive oil with the rest of the ingredients in a small bowl, mashing it together with a fork. Toast the bread slices under the grill, on one side then lightly on the other. Pile most of the herby feta on each lightly toasted side, (leaving a little to top the soups) pushing out evenly with a fork then put back under the grill until golden and bubbling. Reheat the soup and serve in warmed bowls topped with a little of the herby feta and the toasted rye crostini on the side. A fumble, just in case you were wondering or being smutty, is a cross between a fool and a crumble. 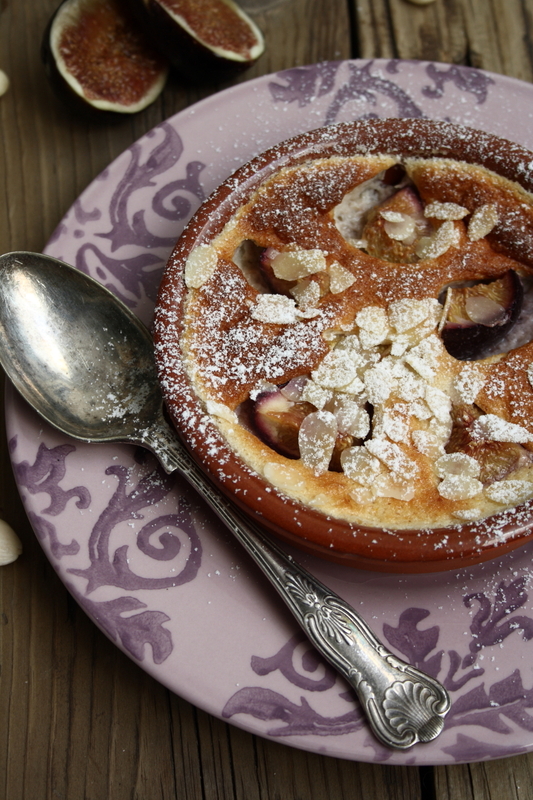 The best bits of two classic British desserts brought together to create something beautiful and simple to make. It is extremely versatile too. You can basically use whichever fruits are in season. Strawberries, apples, plums, mangoes, pears, rhubarb, gooseberries, you get the idea. A fool is traditionally made with a fruit puree or compote stirred (or marbled) through whipped cream. I used goat’s yoghurt instead of cream, the sourness is fantastic with the sweet sticky fig compote. You could use Greek yoghurt or a mixture of yoghurt and whipped cream if you like. 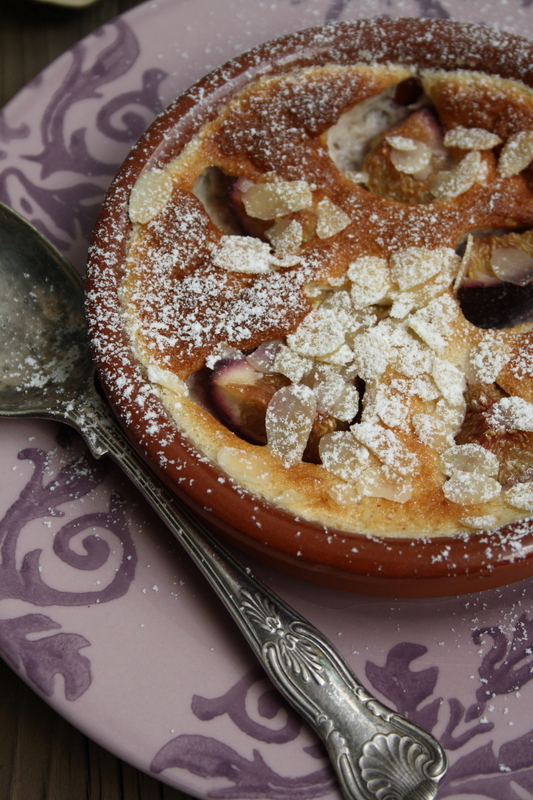 My crumble is made with olive oil and honey rather than butter and sugar so it is all round a really healthy dessert. 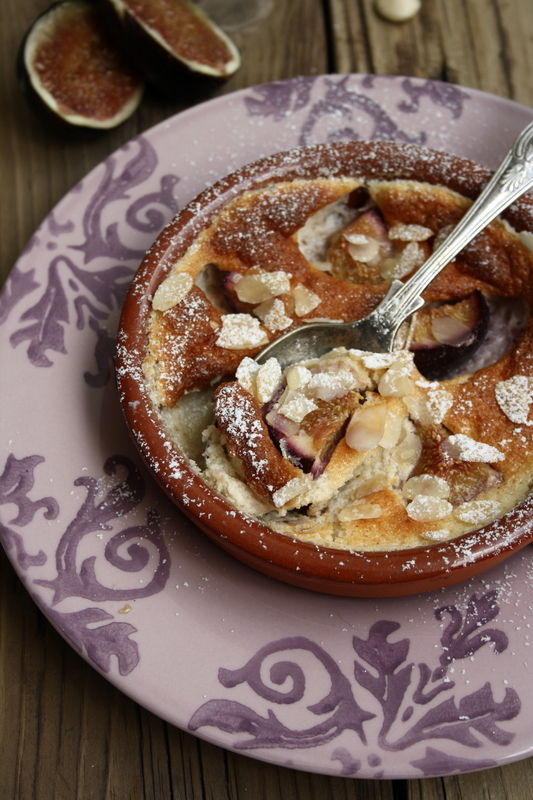 The crumble is given extra flavour and crunch by adding flaked and ground almonds to the mix. 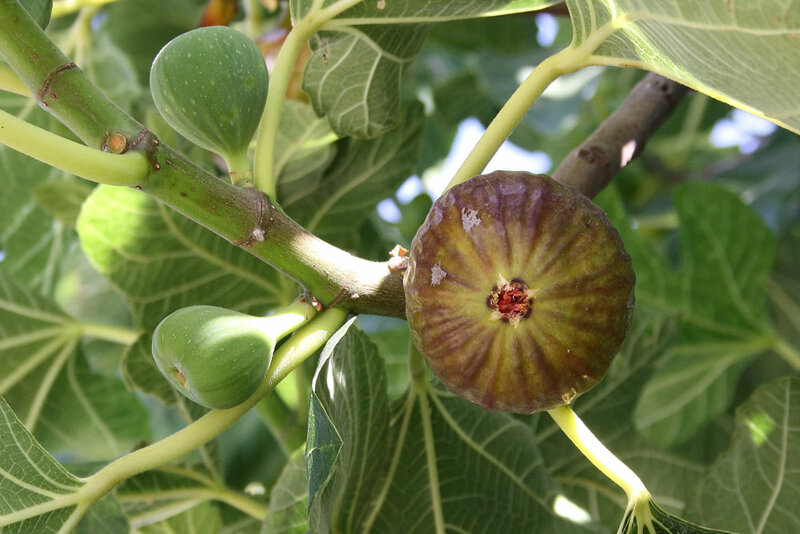 I chose almonds because I saw families picking their almonds at the same time as picking their figs today and the figs at the market looked beautiful. I made a compote with the figs just by cooking them with some honey and a bit of water until it resembled runny jam. I left it to cool while I made the crumble mix. You just spread out all of the crumbly lumps on a baking sheet and cook it until it is browning. When it’s cool you can store it in an airtight container and use it to top ice creams, stewed fruit, yoghurt and anything else you think could do with a sweet crunch. This recipe makes more than you need so you should have some left over, unless you keep picking at it of course. Put the figs, honey and water in a sauce pan, bring to a boil then lower the heat to medium and simmer until it resembles a jammy compote. About 3-5 minutes. Leave to cool. Preheat the oven to 180C and line a baking sheet with parchment. Mix all the dry ingredients together in a bowl. Using a fork, mix in the olive oil and honey the using your fingers make it resemble crumble. You should make lots of clumpy crumble lumps. Spread the crumble out in one layer on the baking sheet and bake for 10-15 minutes but keep an eye on it incase it burns. It depends how big your clumps are as to how long it will take. It should be nicely browned. Now leave it to cool. 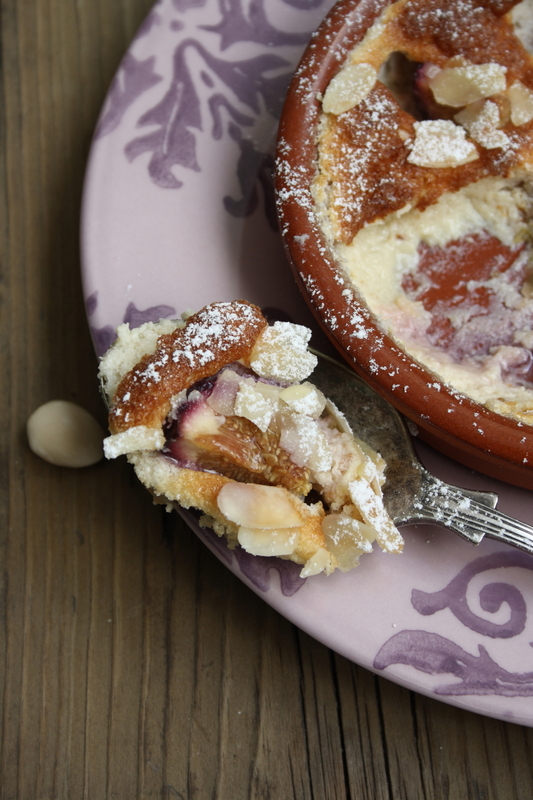 When the compote and crumble mix have cooled, mix the yoghurt and vanilla in a bowl and swirl through the compote. Taste it and add some honey if you think it needs it but remember the crumble is going on top. Pour into serving dishes and top with a generous handful of crumble mix. You may have to crumble it more if you have large clumps. I can’t really call this a recipe. It’s just four ingredients cooked quickly in a pan with some olive oil. Which is about all the cooking I can manage in this heat. I have also been working (in kitchens) for the past three weeks so I also have a slight aversion to being in one longer than absolutely necessary. Moving on to a Roasted Vegetable and Goats Cheese Tartlet with an olive oil spelt flour pastry case, Lebanese Lamb Burger with hummus, chargrilled aubergine, tabouli and tzatziki salad, Vietnamese Rice Paper Rolls with Nuoc Cham dipping sauce and Fresh Fish of the Day with an Asian or Mediterranean marinade. We then moved on to cooking lunch in a private villa for a family of 14 people every day for two weeks. Now this may sound like a bit of a nightmare but luckily they were very open to our “world of flavours” which made our lives a lot easier and more fun. The family was Iranian living in London, Paris, Boston and Switzerland. They meet up once a year for a holiday together. They were lovely people and we really enjoyed cooking for the whole family, including the children, which could be a little challenging at times!! We cooked from a different country every day but our favourite (and I’m sure theirs) was the Persian food that we made. We learnt a lot about Persian cuisine from the Aunties, the Grandma and the nieces which was fabulous. We served a fresh rocket and herb salad every day, they love fresh herbs and greens (sabzi is the Persian word for greens). The Washer Up made a gorgeous Persian Roast Lamb marinated in lots of spices and served with an apricot, orange and date glaze. Pomegranates make everything look beautiful and burst like sweet jewels in your mouth. Alongside the Lamb and Herb Salad we also served Shirazi, a tomato, cucumber and red onion salad with mint and lime juice, Tomatoes Stuffed with feta, apricot and almond couscous and Sabzi (fresh herb) rice. Persian is my new favourite food. I didn’t even like dill before, now I love it! 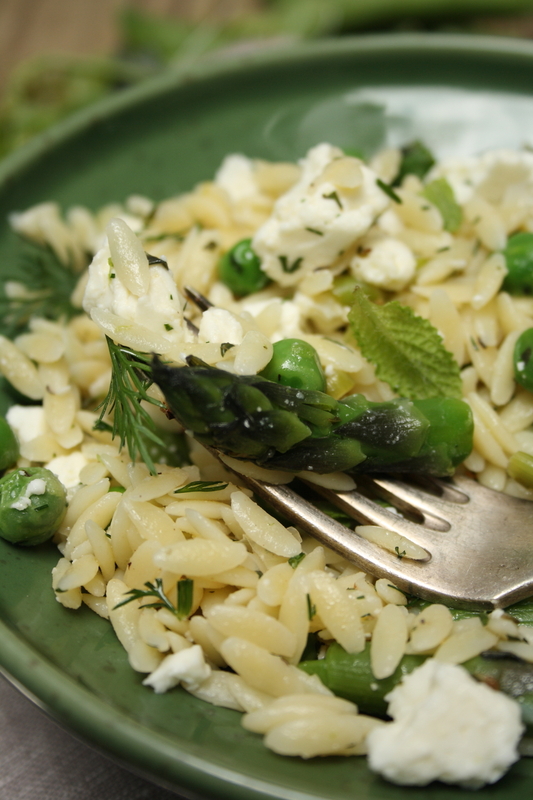 It’s so good in rice and in a Tzatziki dip as well as the mint you should try it. They also add sultanas and chopped walnuts which takes it to another level completely. So back to the non recipe. It’s all about quality and freshness of ingredients if you’re going to go this minimal. We bought some tiny little baby cherry tomatoes and baby leeks from the organic market this Sunday. There they were next to each other as I unpacked the bag. Sometimes it is that easy. Sometimes you are incapable of anything else. Occasionally it all works out perfectly. This was one of those times. We have fresh oregano and thyme growing on the roof so they went in as well. I served them with a poached egg and spinach on brown toast. You could eat them with anything. The next evening we had them with some Italian white bean and rosemary cakes. They would be lovely with a steak or to toss with some freshly cooked pasta or on their own with a chunk of nice bread. Heat the olive oil in a frying pan over a medium high heat and saute the leeks with a pinch of salt for about a minute then add the tomatoes and herbs. Season well with salt & black pepper. Cook, shaking the pan occasionally for a few minutes until the tomatoes begin to split and soften. Serve with anything you like. Date, Walnut and Coconut Energy "Truffles"